The recent U.S. government shutdown caused many hardships for local families, but thankfully Family of New Paltz helped ease some of their burdens. They received a large donation from Garvans Gastropub and the New Paltz Rotary, which completely filled the food pantry. Photo by Ally Turk. The U.S. government just had the longest government shutdown in history, finally reopening after 35 days. One of the issues that came to light during the shutdown was that approximately 800,000 federal employees were forced to go on unpaid leave or to work without pay, making it hard to pay their living expenses. Family of New Paltz participated in Family of Woodstock’s county-wide “Stock the Shelves” food drive from Jan. 23 to Feb. 6 in response to the increased needs caused by the government shutdown. Family of New Paltz is a non-profit organization that operates under Family of Woodstock, offering assistance with emergency food needs, counseling, clothing and access to local resources, among other things. Family of New Paltz hosts food drives and maintains a food pantry year round, but this was a bigger call to action for the county to get involved and help people who were affected by the shutdown. Food, toiletries and pet supplies were invaluable. 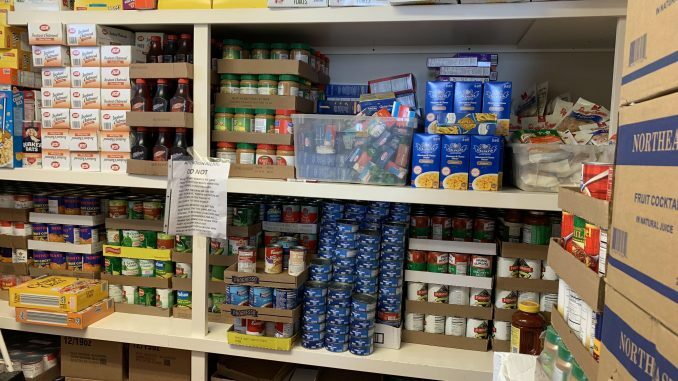 By Jan. 30, the food pantry was completely stocked, even with seven days of the food drive still remaining. Family of New Paltz usually gets the word out for their events by posting on their social media accounts, which rallies the community to come together and help. The food pantry at Family of New Paltz is available to people once a month, but they always have an abundance of bread stocked out front which is available to the public at any time. When Echenique first started at Family of New Paltz in 2016, they were throwing away so much bread because it was going bad. Since then, they’ve started composting all the food that spoils with a local compost company. Family of New Paltz’s biggest fundraising program is the Turkeytrot, a 5k run held annually on Thanksgiving morning to help fund the food pantry and their crisis services. It’s not only solely a run because it also includes prizes for best costume, tee shirts for participants, and the Mashed Potato Fun Run for kids ages 12 and under. The Turkeytrot raises Family of New Paltz close to $40,000 every year. These funds help people with expenses such as auto repairs so people can get to work, rent, electric bills and all the other services which they provide to the public. For more information on Family of New Paltz you can contact them at 845 255-7957. Check out their website at www.familyofwoodstockinc.org, or find them on Facebook or Instagram at FamilyofNewPaltz.